When we work with clients, like you, it’s a true partnership. We treat your business like it’s our own, and work together as a team so you’re completely satisfied with every person we source for you. No lost time as we choose the right people, first time – Our recruitment consultants and labour managers have worked in the construction industry, they know the challenges, what’s expected and the skills and experience needed to do an exceptional job. At BriX Projects, there’s no one size fits all. We find a experienced and skilled tradesmen who are a perfect fit and will work seamlessly and diligently with your team from day one to meet your project demands. Experience increased productivity – BriX Projects is all about quality: Quality people and quality results. Second best is never an option. Our management system is certified against the quality standard ISO 9001:2008, promoting a culture of customer satisfaction and continuous improvement. And our stringent recruitment and performance management systems help us to attract and retain the most highly qualified people for your job. Those whose values align with ours of quality, professionalism, safety, honesty, integrity and responsiveness. With our skilled workforce, you’ll enjoy increased productivity and exceptional results. You save time and money – You can say goodbye to the time consuming and costly tasks of skilled labour hire, recruitment, induction, training, ongoing performance management and payroll, as well as taxes, insurance, superannuation, statutory charges and fringe benefits costs. We do everything from beginning to end, with absolute attention to detail. So you can focus on getting the job done, on budget and on time. You enjoy absolute peace of mind – Safety comes first: For our staff and for your work site. 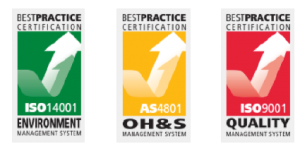 Our workplace health and safety systems are certified against AS/NZS 4801:2001. And our Workplace Health and Safety Manager works with our teams to minimise safety risks by ensuring our workers arrive well trained in current workplace health and safety practices, with the correct skills and certificates, and fully equipped will all necessary safety gear from day one. Regular safety checks on site reinforce this commitment. Personalised service is a given – We are a strong team focused on personal service. Our sales representatives spend time getting to know your business from the start so they can anticipate your needs and meet your expectations. They work with our recruitment consultants to ensure we source the right people for your project and once your project begins, our labour manager’s carry on the relationship. We do what we say we will, and are responsive to your needs. You’ll find that our personalised, responsive labour hire service really sets us apart. Expect open, clear communication – Once your project begins, you will enjoy a single point of contact with a BriX Projects labour manager who becomes your relationship partner, resolving queries and fulfilling your needs. You can expect ongoing, regular communication about anything from rostering, timetables and worker performance, to specific project details, upcoming projects and which special skills or tickets each worker will require. You’ll enjoy a flexible, ‘can do’ approach – At BriX Projects, our ‘can do’ attitude ensures we always go the extra mile, delivering over and above your expectations and tailoring our service to meet your needs for any project and in any situation where you require skilled workers, quickly at an affordable price. No disruption to your business – You can get your project underway or back on track as soon as possible as we always respond quickly to your needs, with the right skilled tradespeople and construction workers, whether for short or long-term projects, to meet urgent, unexpected labour shortages or to manage seasonal peaks and troughs in your business. Enjoy peace of mind and reduced stress – Because whatever your project demands, we have on hand access to a diversity and depth of local and international skilled construction workers from our database of 10,000 candidates who have proven experience across many different trades and industries, to meet them. If you’d like more information on how BriX Projects can help you with your skilled labour hire requirements give us a call today on 1800 621 066 or submit an enquiry and we’ll get back to you. We look forward to having you work with us.